Shannon at Bobbin & Fred has a great interview with needlepoint and cross stitch on needlepoint canvas designer, Emily Peacock. It’s illustrated with pictures of many of her designs. I loved this…her…for me this is the perfect needlepoint person…making her own way…spreading happiness and creativity…thank you! I’m a huge fan of Emily Peacock and found her many years ago when I was looking for more modern, fun needlepoint designs. 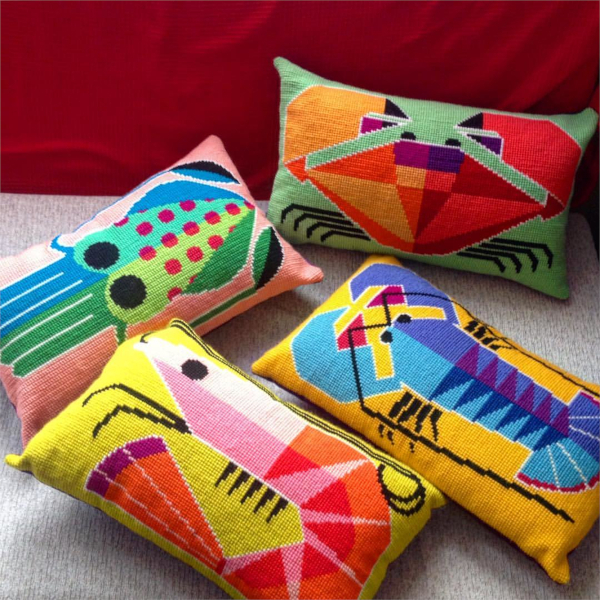 Most of her work is counted — and over the years, I’ve done many of her carnival letter pillows, her rodeo cushion (twice), a couple of her Mid-century Modern designs, and the large HUG and KISS pieces which I had finished as bolsters. She is also terrific to work with — I’ve emailed her questions and also she’s sent additional wool when I’ve had problems or run out. I’m a big fan.